Tuesday March 30th 1897 We went to town this morning. Was over home for dinner. In the afternoon Mother & Hatt came back to town with me. I did some trading and Mother and I went down to see Lizzie Lindley who was at Fanny Grahams. She looks heart broken. She goes to see Scott tonight and the first of the week goes to Idaho for her health. Wednesday March 31st 1897 It rained some this forenoon. I was busy all morning with the work was over to Auntys in the afternoon. I brought home some papers I read all evening. Thursday April 1st 1897 It rained all day long. I did the work, sewed a little for Aunty and read the rest of the time. The boys could not do a thing but the chores all day. 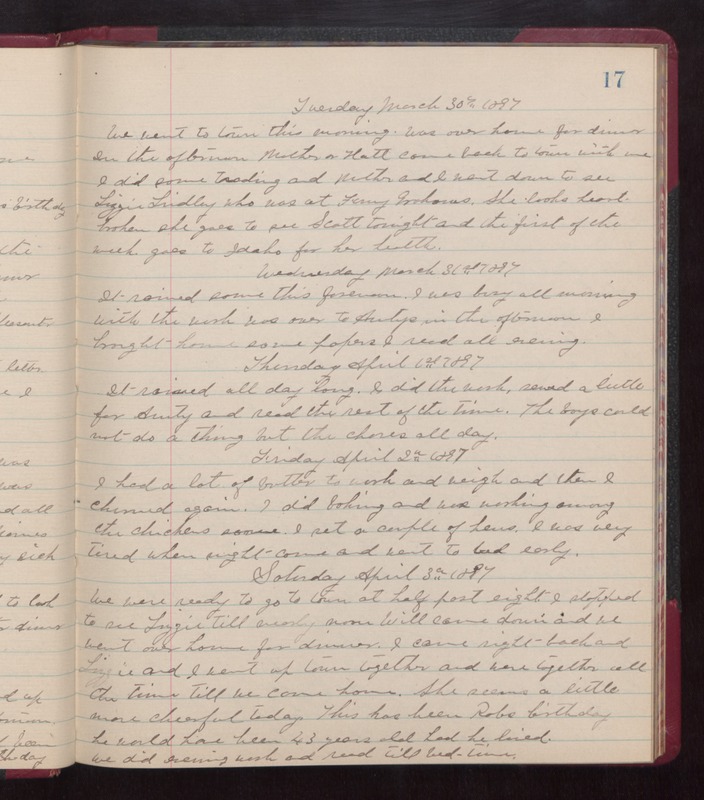 Friday April 2nd 1897 I had a lot of butter to work and weight and then I churned again. I did baking and was working among the chickens some. I set a couple of hens. I was very tired when night came and went to bed early. Saturday April 3rd 1897 We were ready to go to town at half past eight. I stopped to see Lizzie Lindley till nearly noon. Will came done and we went over home for dinner. I came right back and Lizzie and I went up town together and were together all the time till we came home. She seems a little more cheerful today. This has been Robs birthday her would have been 43 years old had he lived. We did evening work and read till bed time.